When we were given our new ‘golf ball’ typewriters we were ecstatic, although we still needed to type six copies at a time (with carbon paper between the pages when doing reports) and not being able to make mistakes certainly honed our skills to be accurate with our typing. … We were often called on to do other jobs as well and had many fun times helping out the producers on outside broadcasts, hosting at the special events (like the Sandover Medal) held in the studios, the Sales Christmas party in the Studio Grounds every year, Miss West Coast, ushering at big events and answering the phones and working at Telethon, etc. 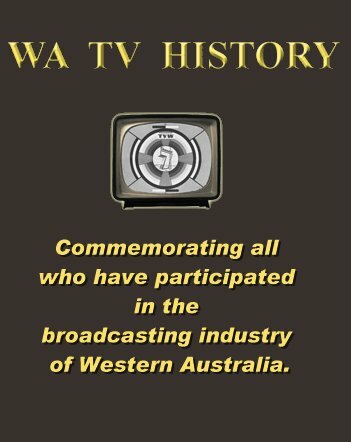 Marion Leyer (nee Greiling) who rose from Production Assistant in 1960 to Producer/Director in 1963, Miss Universe Pageant Co-ordinator in 1979, when she was appointed Production Manager, continuing in that position until resigning from Channel 7 in 1985. …Hilary Everard Secretray to David Farr Station Manager, 6IX, Acting Secretary to Brian Treasure and Assistant Secretary to Jim Cruthers, working for TVW and 6IX Administration TVW Channel 7 and Radio 6IX from 1970 to 1973.